Symach and DCR Systems have announced that the companies will be performing an overhaul at Classic Accident Repair Center to increase the facility’s capacity. As part of the conversion process, Symach technology and equipment will be installed while utilizing DCR Systems’ patented production process. The three cells were set up to accommodate any level of damage severity, from minor work to non-drivable, heavy repairs. Utilizing DCR Systems’ production process, each cell is a separate production area with a paint booth and a u-shaped repair line. One of the cells at the fast-turnaround center is dedicated to low-severity work including the dealership’s internal vehicles that include pre-owned cars, transit damage, lot damage and warranty work. Currently, technicians are repairing about six cars a day in that particular cell. Earlier this year, Symach and DCR Systems formed a strategic partnership, combining their strength to build “tomorrow workshops” for the collision repair industry. As a result, the repair center decided to retrofit that cell to increase capacity to 12-15 vehicles per day. A single SprayTron combination unit, which offers both spraying and drying capabilities, will be added as well as many other DCR/Symach-engineered and complementary tools. A typical booth cycle currently takes about two hours using the facility’s conventional system; however, Roberts said it is expected to cut that time by more than half using the SprayTron. “The SprayTron is the newest generation of spray booths on the market to date,” said Bergaglio. “With this high-performing, automated piece of equipment, Classic Accident Repair Center will be able to increase production and be ensured of a consistent and balanced airflow.” “With fast-moving work, you have to have ample curing,” said Giarrizzo. “Symach technology is curing from the inside out, so we can put that car into the customer’s or dealer’s hands quickly and ensure it is repaired correctly.” Construction began in November and the cell is expected to be operational March 1. 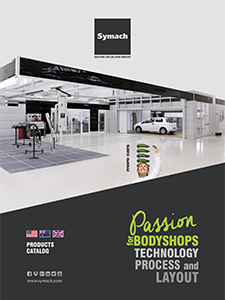 “Utilizing Symach equipment and the DCR Systems’ patented production process, we will be able to turn around those cars quickly with the confidence that they are repaired properly and fully cured,” said Roberts.